A group of seven men enrolled in the College of Agriculture at Oklahoma A&M in the fall of 1920, and actively encouraged by AD Burke, Professor of Dairy Manufacturing, organized a club of agriculture students shortly after school began in September of that year. The purpose of the club was to foster a closer relationship between outstanding students in the various departments of the College of Agriculture and if possible, to continue that relationship after graduation. It had become clear by January of 1921 that there would be advantages to be gained by affiliation with a national professional organization with the same general objectives of the local club. A rumor that a national agriculture fraternity was interested in establishing a chapter at Oklahoma A&M College began to circulate on the campus about the last of January. The initiation team composed of Brothers HF Wilson and past Grand President TD Harman Jr. arrived at noon on May 19th, 1921. At 2:30 pm the 18 petitioning members of the Sigma Alpha Club were formally inducted into membership in Pi Chapter of Alpha Gamma Rho. A banquet honoring the occasion and the instillation team was held in the Presbyterian Church Annex at 6:30 pm on the evening of the instillation. Dr. Henry G Knight, Dean of Agriculture was present as the guest speaker. He welcomed Alpha Gamma Rho as another organization, which could have a great influence for good on the campus. To make better men, and through them a broader and better agriculture by surrounding our members with influences tending to encourage individual endeavor, resourcefulness and aggressive effort along lines making for the development of better mental, social, moral and physical qualities; to promote a wider acquaintance and a broader outlook on the part of agricultural men through fellowship in a national organization that stands for the best social, mental and moral development. 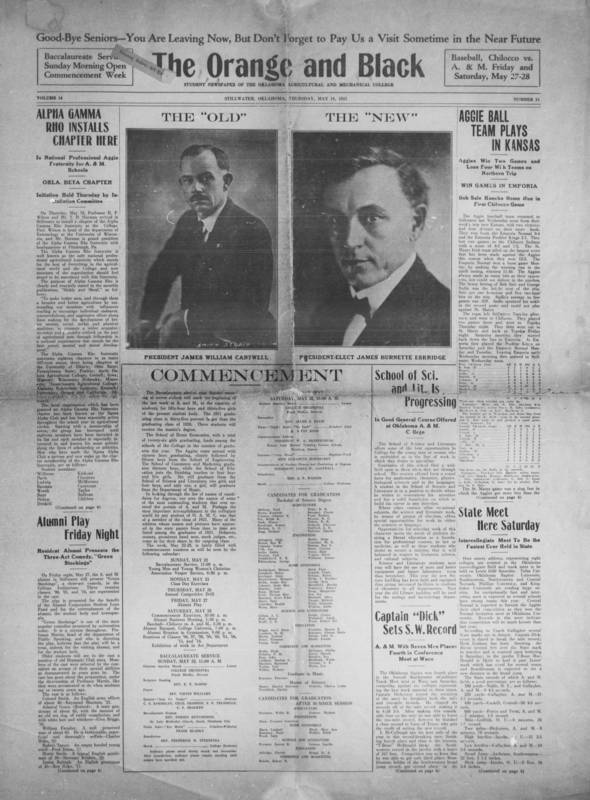 Read The Orange and Black from Thursday, May 19, 1921 and learn about the night Pi Chapter was inducted into the National AGR Fraternity. The National Fraternity of Alpha Gamma Rho became a reality on April 4, 1908, when two local fraternities combined. These were Alpha Gamma Rho founded at Ohio State University on October 10, 1904, and Delta Rho Sigma founded at the University of Illinois on February 6, 1906. Members of these two groups happened to meet in 1906 at the International Livestock Exposition in Chicago. After finding that their individual interest and purposes were similar, and after considerable correspondence and several trips back and forth, the two groups decided to incorporate and set up a national fraternity. Brother Lowell E Walters, Initiate 207, served the National AGR Fraternity as Pi Chapters only Grand President from 1962-1964. He was born in Freedom, Oklahoma in 1919 and graduated from Oklahoma A&M in 1940. Brother Walters served for two years as associate Chapter Advisor and two years as Advisor to Pi Chapter before accepting the position of Southwest Province Counselor for two more years. Following this, in 1960, he was elected Grand 2nd Vice President of the National Fraternity, Grand 1st Vice President and later served as Grand President of Alpha Gamma Rho (1964-1966). Brother Walters dedication to AGR is best summed up by his own words after being named National Grand President: "AGR has afforded me a bountiful harvest of the fruits of the finest brotherhood that I know. The fraternity has given me the opportunity to know personally many of the great men in modern agriculture. As a result I have become aware of the real challenge and responsibility we in America must meet through our efforts to improve the standards of living for our neighbors around the world."